There is too much WRONG information out there, and it’s hard for private practice owners. What you need is the right information, the right game plan, done-for-you blueprint and real-world examples that are working in today’s tough economy. This one-of-a-kind three-day meeting of the top minds in private practice will be a game-changer because the individuals who share their cutting-edge strategies and tactics are the ‘real deal’, not some ‘theoretical experts’ reading jargon from outdated manuscripts. 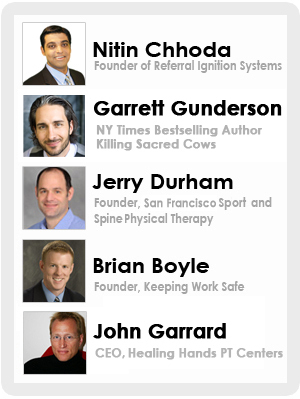 In fact, the speaker lineup at the 2014 Retreat is nothing short of extraordinary. I have personally put together the most value-packed, no-nonsense workshop ever for entrepreneurial private practice owners like yourself. Truth be told, up until now I’ve only shared my best kept patient landing, referral generating secrets with my top paying private practice mastermind clients who pay as much as $30,000 to gain access to me. Since the past six years, I have coached and mentored groups of success-minded physical therapists like yourself on ways to explode their practice by revealing my most advanced marketing techniques to attract new patients, hire staff, manage money, identify priorities and build a waiting list of patients eager to get in. We’ll allow our success stories to speak for themselves. Most attendees have reported a MINIMUM referral increase of 10-15% within 2-3 weeks of implementing some of my specific strategies. Each speaker has a unique presentation lined up for you at the 2014 Retreat. You’ll learn time management and the importance of ‘high lifetime value’ activities. You’ll learn how to transition from survival to success, and eventually, to significance in your practice. Be prepared for an experience unlike any other. It’s the Private Practice Retreat. 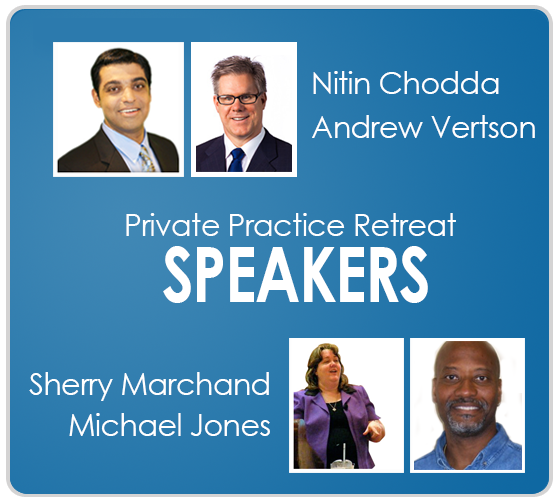 The event that will change your perspective on private practice and you’ll return completely energized, ready to take charge of your practice. Just ask the hundreds of practice owners who have attended our events in the past! 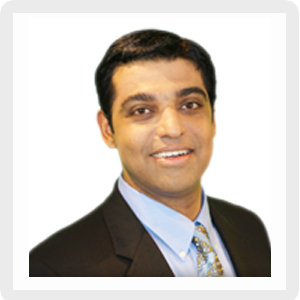 Considered the number one private practice marketing expert in the world (Wikipedia) and writer for several magazines like ADVANCE, PT Magazine, IMPACT and the #1 ranked blog on physical therapy marketing on Google, Nitin Chhoda has one goal – to deliver the most powerful business building tactics for your private practice. He is the author of “Marketing For Physical Therapy Clinics” (featured on Amazon), the creator of the landmark “Referral Ignition” plug-and-play patient generation system, the “Therapy Newsletter” and “Clinical Contact” marketing systems. He is also the CEO of In Touch EMR and In Touch Biller Pro, the most advanced documentation and billing systems in the industry. Combined, these products have been used by over 12,457 physical therapy private practice owners in seven countries including the United States, Canada, Australia, England, and the European Union to get new patients, increase efficiency, save money, and boost the level of freedom and independence in their practice. With more than fifteen years of clinical experience and extensive continued education in outpatient orthopedic and athletic settings as a licensed physical therapist, Andrew Vertson is one of the most well known private practice owners in the country. Andrew has worked with professional athletes from the NFL, NBA, NHL, Major League Baseball, in addition to numerous Olympic gold medalists and movie & television personalities. In addition to successfully building 7 physical therapy private practices, Andrew has served as operations director of 8 other practices during his career. Currently, he owns Intecore Physical Therapy with 3 offices in the Orange County, California area. Combined with his insight and experience, Andrew will teach you everything you need to grow your private practice from the ground up. You’ll discover how to manage a growing practice, which metrics to watch out for and how to motivate your staff. 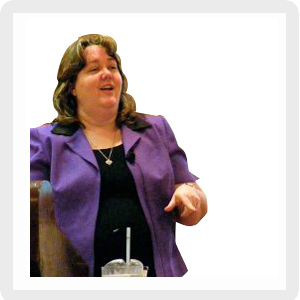 Sherry Marchand is a national seminar instructor for Cross Country Education the industry leader in healthcare seminars. Sherry is a reimbursement analyst and a billing, collection and chart-auditing consultant with nearly 22 years of experience in the health care industry, including hospital and physician group billing and collection management. Her vast knowledge of the Medicare regulations, documentation guidelines and practice management process has come from working in various levels of health care accounting, including serving as a certified auditor and an expert witness for federal criminal court. She has experience in the management of international hospital billing. As a certified, self-employed practice management consultant and chart auditor, Ms. Marchand has helped numerous medical offices take control of their cash flow through implementation of billing and documentation processes. Her specialties include Internal Medicine, Obstetrics, Mental Health, Physical Therapy, Cardiology, ENT and Surgical Specialties. Sherry is skilled in installation training and implementation of hardware and software systems that are right for the health care arena. Sherry will share inside tips and strategies to get your office on the road to healthy patients and insurance collections. 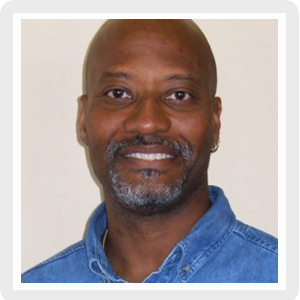 Michael Jones is a physical therapist with more than 27 years of experience. Back in 1992, Michael had the vision that “exercise was the key to long-term management of most medical conditions”. That evolved into a shift in the philosophy of his clinics and eventually to the launch of the Medical Exercise Specialist program in 1994. Michael is extremely excited about the future prospects for medical exercise services and post rehab fitness. “We need more professional and well trained Medical Exercise Specialists, Post Rehab Conditioning Specialists and Medical Exercise Program Directors. 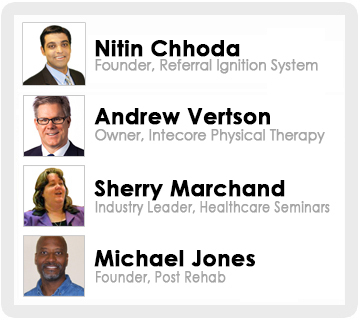 Michael conducts courses worldwide on post rehab programs, which help ‘Bridge the Gap Between Health Care and Fitness’.